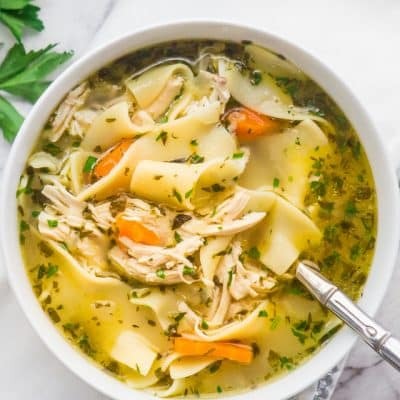 Instant Pot Chicken Noodle Soup made from scratch and in a fraction of the time. Delicious and hearty, loaded with noodles and chicken, this soup will warm the cockles of your heart. I wished for snow for Christmas and my wish came true tenfold. While it was beautiful while snowing, now I don’t wish for it anymore, but I’m stuck with it. That and the temperature, because it’s been very cold. 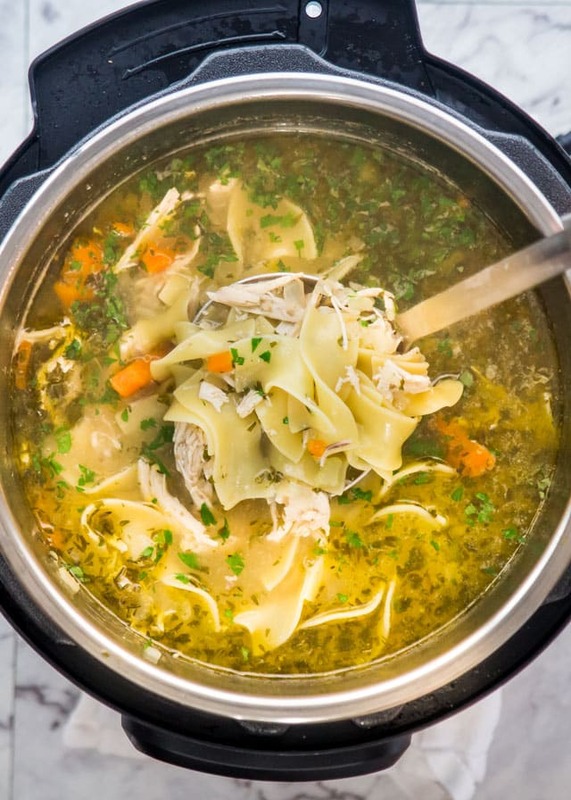 Nothing’s better on a cold winter night than a bowl of comforting chicken noodle soup. Especially when you have a cold. Not me, but hubs does. Which is why I decided to make him a chicken noodle soup, in the instant pot because you guys have been emailing me for more and more IP recipes. While I have some coming over the next few months, I thought now would be the perfect time for a chicken noodle soup. The secret to good chicken noodle soup is to make the broth from scratch using chicken with skin and bones. My mom always made her soup with a whole chicken, lots of carrots, onion, celery and sometimes a parsnip for more flavor. The end result is always the best and tastiest broth and my favorite part was always the noodles. Oodles of noodles, the more the better. 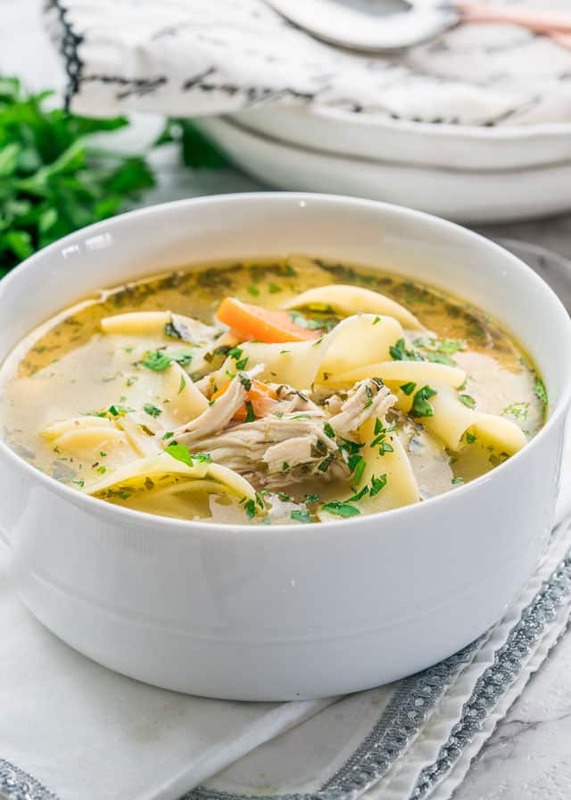 This Instant Pot chicken noodle soup is similar but it takes a lot less time and the soup is just as incredible, loaded with tons of flavor. I did not use a whole chicken, it’s not necessary, but you’ll need about 2 lbs of chicken with skin and bones. You will want at least one chicken breast, so that you have some to shred after to add back to the soup. The biggest advantage of using the Instant Pot to make this soup is of course time. It takes 7 minutes to cook the chicken for that delicious broth. Someone asked me if the food cooked in the Instant Pot is bland and I think the exact opposite is the truth. I find the flavors richer and much deeper. When you open that lid after cooking and the aromas hit your nose, you won’t be able to wait till you have a taste of this soup. One thing to note is I didn’t cook the noodles with the chicken on the soup cycle and that is because I didn’t want to end up with mushy noodles, noodles cook quick anyway, so I didn’t think it’s necessary. Add the butter and cook until the butter has melted. Add the onion, carrots and celery and saute for 3 minutes until the onion softens and becomes translucent. Season with salt and pepper, add the thyme, parsley, oregano and stir. Pour in the chicken broth. Add the chicken pieces and add another 4 cups of water. Close the lid (follow the manufacturer's guide for instructions on how to close the instant pot lid). Set the Instant Pot to the Soup setting and set the timer to 7 minutes. Once the Instant Pot cycle is complete, wait until the natural release cycle is complete, should take about 10 minutes. Follow the manufacturer's guide for quick release, if in a rush. Carefully unlock and remove the lid from the instant pot. Remove the chicken pieces from the soup and shred with two forks. Add the noodles to the soup and set the Instant Pot to the saute setting again. Cook for another 6 minutes uncovered, or until the noodles are cooked. Turn off the Instant Pot, by pressing the cancel button. Add the shredded chicken back to the Instant Pot, taste for seasoning and adjust as necessary. Garnish with additional parsley if preferred. What is an Instant Pot: An IP is a multi-cooker, it's like seven different appliances all in one! It does the job of a slow cooker, pressure cooker, rice cooker, steamer, yogurt maker, etc. 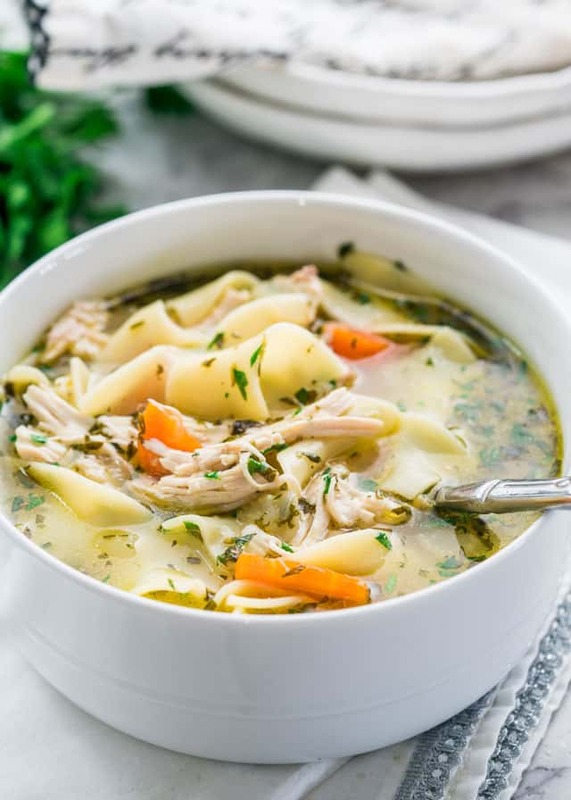 I don't have an Instant Pot, can I still make this soup: Absolutely, you would follow the exact steps except it would take a bit longer to cook the chicken in the broth. Or you can see my Homemade Chicken Noodle Soup or Crockpot Chicken Noodle soup recipe for the crockpot version. Can I use boneless skinless chicken breast: Yes, of course but cooking the chicken with the skin and bones will give you a deeper more delicious broth. Can I use chicken drumsticks or thighs: Yes, you can. Any part of the chicken can be used, as long as you have enough chicken meat to add to the soup after you shred it. Can I use frozen chicken: Yes, you can. The time can vary depending on how big your chicken pieces are but I would start with 10 to 12 minutes and go from there. Why use chicken broth, can I just use water instead: Yes, you can absolutely replace the chicken broth with an additional 4 cups of water. Can I freeze this soup: If you plan to freeze the soup, hold off on adding the noodles. Wait to add the noodles when you take the soup from the freezer and reheat it. The noodles won't hold up very well when defrosted and reheated. My normally very strong man is very ill. After the dr today and a go home a rest prescription lol I went looking for a chicken noodle soup recipe. This looked very Hearty and so good. I can say while everyone was getting up from the table I over heard someone ( my husband say) 🤫🤫🤫 it’s way better then mine(his) and is even better then my mamas(my mother in laws) chicken noodle soup. 🤯🤯🤯. Hey now listen my mother in law is the best of best. When. I am sick I want HER soup. Not her recipe but her to make ME soup. Lol. Now that is a compliment if my husband says it’s better then his mamas. Wow !!! I did something better then my mother in law !!!! No way!!!! She is Mary poppins. She is the almighty❤️❤️❤️❤️ I would totally recommend to anyone who is looking for a REAL CHICKEN SOUP RECIPE!!!! Now as I am typing all of this he let out a big sigh and said mama (to me) my belly is soooooo full and happy. I already can tell he is feeling better. I didn’t know it was possible that quick. Will this taste okay if I only use chicken breasts? I had a terrible head cold last week and I got to thinking about my grandmother’s chicken noodle soup. “Jewish soul food” she called it. Well, being sick and really craving some chicken noodle soup, I had my wife go to the store and get the ingredients for this recipe. I cooked up a batch of this soup and it was delicious. I ate this for 3 days and my cold was gone. I’m not saying it was the soup but it sure made me feel better. Thank you so much for this recipe!! 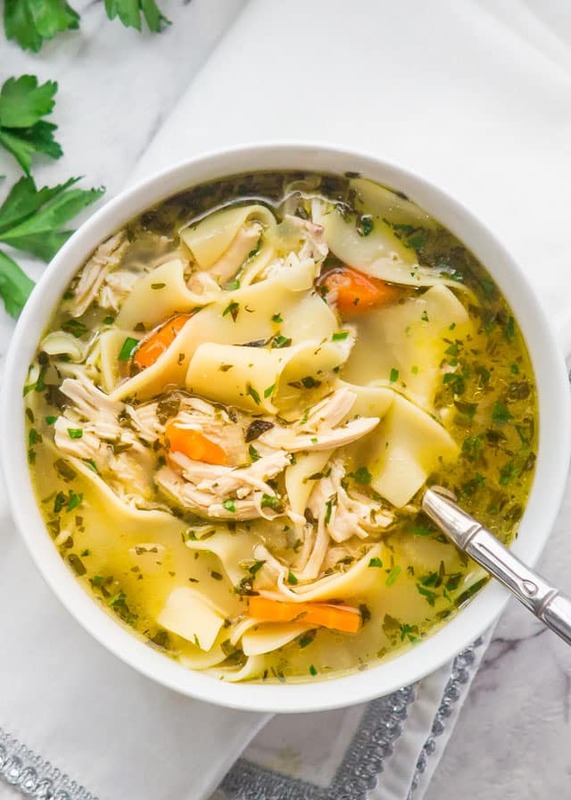 I’ve made chicken noodle soup a million times and it always turns out , although sometimes the balance between leaving the chicken and long enough to give the flavor to the soup and taking it out soon enough so it doesn’t get overcooked can be tricky . but was looking for an instapot recipe version and was skeptical I thought the carrots would get hammered , but it worked out so amazing! I’m a caterer and I made some for my client today. I don’t have an instapot I have a ninja foodi so we don’t have a soup button so I just did Hi Power for 6 minutes and then natural release. And it worked out so great. Thank you thank you thank you! If I was going to use 3 boneless skinless chicken breasts, would the time be the same? Also can I use manual setting and for how long? Yes same amount of time! Manual for 7 minutes on high pressure will work just as well. what size instant pot are you using? thanks! We use the 6qt pot! I agree with you about not adding the noodles. But you never stated how to adjust the timing if you didn’t add them and turn the IP to saute. I added another 3 minutes to the Soup time. Next time I need to take off at least a minute. I also added oregano and basil. Next time I will add parsley and more garlic. I’m not sure what you mean. You add the noodles after you take out the chicken and shred it and cook it on Saute mode for another 6 minutes or until the noodles are cooked through. I’ve made this twice now and my family loved it. I have an 8 quart IP, so I used three cartons of no salt added chicken stock. I used 5 drumsticks and 4 boneless skinless thighs. Thanks for a great recipe! Just got my Instant Pot DUO Plus 8 Qt yesterday and looked up chicken soup recipes as there was”t one in the included recipe book. Tried yours and it turned out amazing!! This was the first thing I made in my new pot.I’m not one that leaves reviews a lot but just wanted to let you know how happy I was to find your recipe. I’ll gladly be passing it on. It was easy to follow, quick & delicious. Thanks so much for sharing it. How can I adjust this recipe for a whole chicken? THANKS! If you have a larger IP, you can double all the ingredients. Otherwise you can keep the ingredients the same, but you’ll end up with a lot less broth because the chicken will be taking up a lot of room. I would also spatchcock the chicken for maximum flavor. I used a whole chicken a little over 4 pounds and doubled everything else but didn’t have room for all the liquid…….I have an 8 qt ip so you need to decide if you sound want less juice otherwise that’s it. Still turned out great didn’t adjust anything else. This was so delicious and perfect for a very cold snowy day. Thank you for my new ‘go to’ chicken noodle soup recipe! This is the first thing I made in my new instant pot and it is easily the best chicken soup I have ever made! Thank you for sharing this recipe. On the Instant Pot, what temperature do I set for Saute and Soup settings? I have the Instant Pot Ultra. I am finding that the Natural Release is taking over 30 minutes. I switched to quick release after 30 minutes. The Instant Pot that we used for this recipe doesn’t have different temperature settings for saute or soup! I would refer to the manual to get an idea. What constitutes a serving size? My mom is on a low carb diet for diabetes and I have to measure/weigh everything. Thank you. The recipe makes about 8 servings, so about 1 1/2 cups worth. Awesome!! !- Made it without the chicken to start, and with veggie broth (all 8 Cups), since we didn’t have the chicken or chicken broth available. Hubbie is bringing the chicken home later. My two sick teenagers loved it right from the start. So the Chicken is going to be a BONUS!! Even better, I’m a vegetarian, and I Love the pre Chx. version!! Easiest, most flavorful chicken soup I’ve ever made! I was skeptical that 7 minutes would be long enough to cook a bone-in chicken breast. Lo and behold, it came out perfectly. This is the only chicken soup recipe I will ever use again. If I double the recipe do I need to double everything or just the water and broth? I would double everything so your soup is nice and flavorful! This is wonderful and easy. Made to directions, using chicken breasts and thighs. The only thing I would do next time is chill the broth and veggies after removing chicken. That should bring fat to top for removal. I did cut carrots to noodles to cook cuz I love me lots of carrots. Soup has a wonderful flavor. Thank you for the recipe. Oh, this was the first time I used sauté setting on my instapot and it worked great.